.45 Colt is one of those rounds beloved by a dedicated group of followers, yet ignored by many shooters - especially new ones. This is unfortunate, since the round is tremendously powerful and incredibly versatile, with loadings ranging from those that nearly replicate the ballistics of a .44 Magnum and target loads with recoil like mild .38 Specials. The only issue? For the longest time, no revolver suitable for both hunting and home defense was chambered in it. At least, until the recent introduction of the newest Ruger Redhawk, chambered in both .45 Colt and .45 ACP. My first encounter with the cowboy classic .45LC or Long Colt, was back in 1999. A tactical weapons enthusiast, I didn't see much need for an antiquated cartridge that no modern firearm was chambered in. It wasn't until an older gentleman offered me his .45LC Ruger Blackhawk in lieu of payment for some landscaping that I gave it a second glance. Like the author, many people incorrectly assume .45 Colt is simply an antiquated cartridge with similar ballistics to .45 ACP wearing a higher price tag. In actuality, the round can be loaded to surpass all but the hottest .44 Magnum recipes due to the unused case space resulting from its black powder origins. Though it's important to note that Colt Single Action Army pistols and their clones are in no way designed for these 'Ruger-safe' high-power loadings. Even with its potent ballistic prowess, this still begs the question, "So what?" Why should a shooter bother with a round that almost replicates the awesome power of a .44 Magnum, when they can simply buy the same gun in .44 Magnum? Three words: cost of ownership. Neither .44 Magnum, or .44 Special are affordable to shoot recreationally - though neither is .45 Colt. Thankfully, the new Redhawk can also fire .45 ACP rounds, which are much cheaper and benefit from much greater local availability. Additionally, a huge variety of defensive loadings are available for the round, and since the Redhawk is a revolver, shooters can load ultra soft-shooting recipes without having to worry about cycling the action. So long as the chosen load has enough power to fully propel the round out the barrel, the next shot can be safely fired. Back to the gun, for those not in the know. 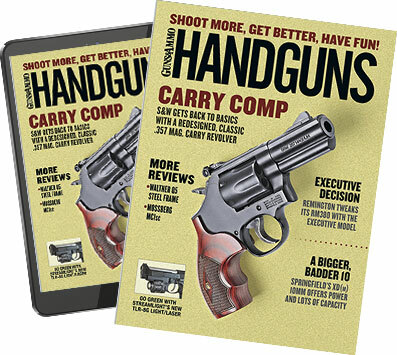 The Ruger Redhawk is a double/single-action revolver with famously robust construction; oftentimes, reloading manuals will have a separate section for 'Ruger-safe' revolver-loads. The model reviewed features post and notch sights, the rear of which is fully adjustable for windage and drop.The front sight features a blaze-orange insert for faster target acquisition and better visibility in low-light settings. The frame is made from stainless steel and features laser-cut, rounded wooden stocks better suited to double-action shooting than traditional single-action-oriented ones. The barrel is half-lugged and 4.2-inches long, giving shooters a compromise between lengthy hunting barrels and abbreviated ones meant for concealed carry. One feature of note is that, due to its ability to use both the rimmed .45 Colt round and the rimless .45 ACP, it ships with three full moon clips for use with the latter, greatly aiding in both reloading speed and spent case extraction. In testing, the overbuilt revolver functions like two completely different pistols depending on trigger mode and caliber. Shooters running hotter .45 Long rounds in single action will find it functions much like the Magnum-caliber Redhawks, as an accurate, hard-hitting hunting handgun. Defensive-minded or competition shooters running the Ruger in double-action with standard 240gr ball or lighter-load wadcutter .45 ACP rounds will wonder if the Redhawk is the big-bore brother of the GP100 Match Champion. Though few things in life are truly equal, so which face of this Janus-like six gun is the true face, and who is this pistol marketed to? After firing hundreds of both .45LC and .45ACP rounds through the gun in both single and double action, the answer is perfectly clear. It's neither, and both. Shooters expecting a compromise with the Redhawk haven't taken a closer look at Ruger recently. With their new facilities in North Carolina, Ruger is able to develop, test and deploy new products every six months while incorporating new improvements to existing platforms. The design's concept itself speaks volumes to this, and the fact that every Ruger employee is beta tester for all new products. The Redhawk's large frame is designed for the punishing recoil of full-powered Magnum loads. While .45LC is potent in its own right, it pales by comparison to so-called, "Ruger-load" .44 Mag loads. Consequently, the hottest commercial .45LC loads are surprisingly controllable, while all but the most nuclear .45ACP rounds feel like .38 special target loads. Accuracy from the .45ACP and .45 Colt rounds is similar, though it's important to note that in testing the point of impact shifted as much as two inches at 25 yards. Not enough to affect defensive use, but hunters considering zeroing their Ruger with lower-powered .45ACP rounds should reconsider. The new Ruger Redhawk bridges the gap between defense-oriented Ruger revolvers and the more archaic single-action hunting models. What conceptually could have resulted in a lackluster compromise that left shooters with a revolver impotent at every role achieves near-perfection as a pistol that refuses to compromise. Normally, products that claim to fill multiple roles perform mediocrely at both. Thankfully,Ruger's new Redhawk is anything but normal, delivering a hard-hitting hunting revolver that doubles as a potent self-defense tool.